MoistPal is completely web-based so no installation is required. Each user has a personal login. MoistPal used with a android app downloaded from Google Play. The moisture ratio is measured by the resistance similarly to the market dominating the meters. The design of MoistPal also permits that the way the measurement is carried on may be varied in software and new measurement algoritms can be used. An important variable in the calculation of the moisture ratio is temperature. MoistPal has a separate built-in gauge for temperature. Transferring of data via Bluetooth, and can thus be directly linked with a smartphone, PC or other device that has Bluetooth. MoistPal alerts automatically if a measurement not seems to be ok. E.g. if measured in air. Measurement data is transmitted and stored automatically so that users immediately after the measurement can print reports, etc. Standard reports that compiles measurements. Data can also be easily exported to e.g. Excel. 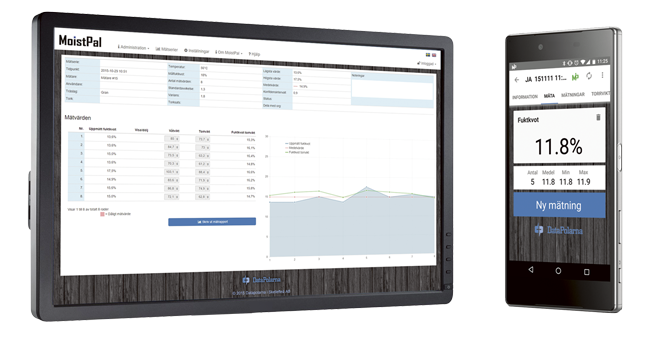 Data from MoistPal can be downloaded and integrated with other systems such as SawInfo, drying system, ERP etc. The MoistPal hammer has lots of smart features to enhance operation: Key for reading directly on the hammer, sound damping, vertical adjustment automatically, stable attachment of pins, etc. With MoistPal follows a subscription plan where data storage, reports etc. are included.